Railpictures.ca - Jason Noe Photo: During the night of February 10, CN A431 with 9675 and 9482 had a long and heavy train when it departed MacMillan yard in Toronto. Once on the Guelph Subdivision, the Niagara Escarpment grade proved too powerful for the two four-axle units. The train retreated back to (Silver) Georgetown and set-off the majority of its Stratford cars before trying another run at the grade. Eventually the units made it over and then go on to set-off 39 cars in Guelph before finally arriving in Kitchener after sunrise. The train then tied-down in Kitchener and CN would order an X431 to lift the cars left on the Halton Subdivision by A431 and bring them the remaining distance to Kitchener. Here pictured in the Kitchener yard from left to right, CN train L568 with a trio of GMTX units waits on the yard lead across from A431’s power from the night before while X431 with 2427 has just arrived with a long train of hoppers. | Railpictures.ca – Canadian Railway Photography – photographie ferroviaire Canadienne. Caption: During the night of February 10, CN A431 with 9675 and 9482 had a long and heavy train when it departed MacMillan yard in Toronto. Once on the Guelph Subdivision, the Niagara Escarpment grade proved too powerful for the two four-axle units. The train retreated back to (Silver) Georgetown and set-off the majority of its Stratford cars before trying another run at the grade. Eventually the units made it over and then go on to set-off 39 cars in Guelph before finally arriving in Kitchener after sunrise. The train then tied-down in Kitchener and CN would order an X431 to lift the cars left on the Halton Subdivision by A431 and bring them the remaining distance to Kitchener. 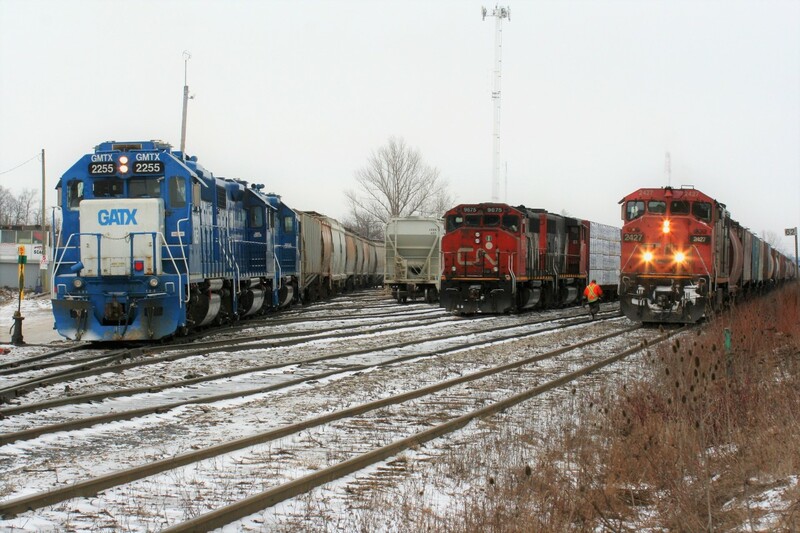 Here pictured in the Kitchener yard from left to right, CN train L568 with a trio of GMTX units waits on the yard lead across from A431’s power from the night before while X431 with 2427 has just arrived with a long train of hoppers. Thank you for all the comments Host, Alex, Steve and Kevin. Yes, I believe they stayed X431 as well as that would have been the train getting re-crewed. The taxi from Toronto showed-up just before 15:00 and the guy had a hard time tracking down the crew as they went down to the east end of the yard to get to their train after putting all the units together. Another taxi must have come with a fresh crew from Toronto after 15:30 to take it back to MacMillan yard. No. That track is now severed. Are they still tying units up at Kitchener station? Since the takeover it seems busier at Kitchener. I question the 4-axle power on A431. I also heard CN is a bit power short, so maybe that explains it. So far, A431 has been having a lot of issues with making that grade. Sure makes things more interesting though. Wow. That’s about 4 times the number of locomotives that I even saw on one day in Kitchener. And I was there from 1973 to 1984! X431 re-crewed at Kitchener and went back east. I’m assuming it’s just a re-crew – 330/331 changes crews and symbol does not change..
Nice three way meet Jason! I did not realize that 431 left a train on the Halton – I heard they sent a unit light power ex Mac. Must have lifted where – norval?